If you are a Twitter user, Twitter request you to change the password. Twitter has identified a bug, it has been fixed now and wasn’t misused – prompted the company to issue this advisory. 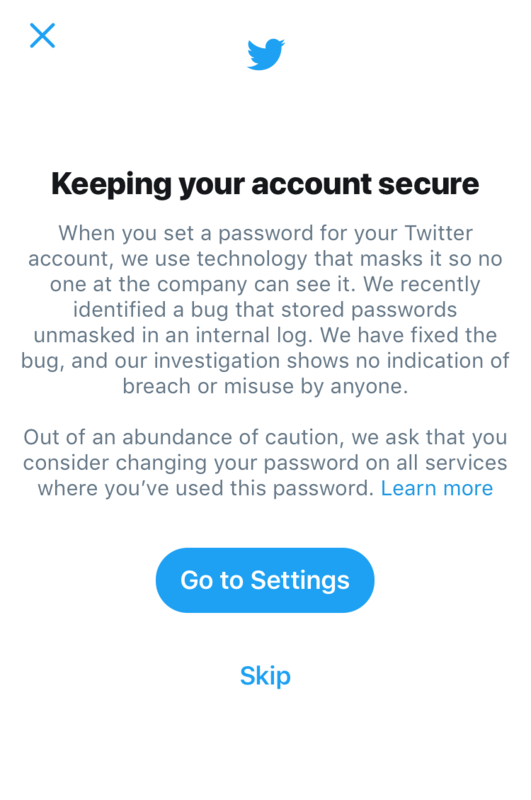 Twitter mask passwords through Hashing process using a function called bcrypt, which replaces the actual password with a random set of numbers and letters that are stored in Twitter’s system. Due to the bug, the passwords are written to the internal log before completing the Hashing process (Password without Encryption – Plain Text). This bug has been identified by Twitter itself and it has been fixed now. Twitter also confirmed that the issue will not happen again and it is implementing plans to prevent it in future.